Flat slabs are highly versatile elements widely used in construction, providing minimum depth, fast construction and allowing flexible column grids. Construction of flat slabs is one of the quickest methods available. Lead times are very short as this is one of the most common forms of construction. 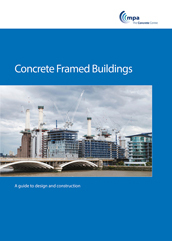 Because this is one of the most common forms of construction, all CONSTRUCT members and many other concrete frame contractors can undertake this work. Flat slabs are particularly appropriate for areas where tops of partitions need to be sealed to the slab soffit for acoustic or fire reasons. Flat slabs are considered to be faster and more economic than other forms of construction, as partition heads do not need to be cut around downstand beams or ribs. Flat slabs can be designed with a good surface finish to the soffit, allowing exposed soffits to be used. This allows exploitation of the building’s thermal mass in the design of heating, ventilation and cooling requirements, increasing energy efficiency. Flat slabs provide the most flexible arrangements for services distribution as services do not have to divert around structural elements.